Mystic Pointe 200 is the second of six Aventura condominiums found to the east of Turnberry Isle and just across the street from the water. 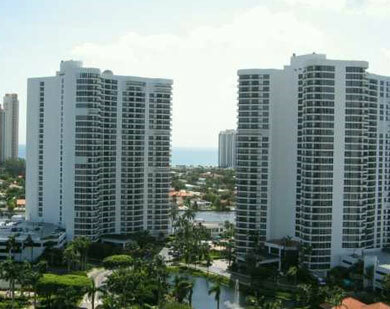 This building has two and three bedroom Aventura condos for sale with 1,181 to 1,684 square feet of living area. At 30 stories, the views from this building are truly delightful and only get better near the upper floors. Take a plunge inside the Mystic Pointe 200 swimming pool or ease tense muscles after a hearty workout in the sauna. For something a little more intense, play some tennis at the clay courts. If you're looking for something relaxed, you can keep your boating vessel at one of the docks that can accommodate vessels up to 100 feet long. You'll find 282 units within Mystic Pointe 200 boasting spacious terraces, modern kitchens and much more. It's important to note that Mystic Pointe 200 is pet friendly, as is the rest of the Mystic Pointe condos with the exception of Mystic Pointe 100. Aventura Mall is just around the corner from Mystic Pointe 200 and is one of the most popular shopping centers in South Florida, not to mention the fifth largest mall in the country. If you're a beachgoer, there are three unique cities near Mystic Pointe 200 that offer sunny sands to sunbathe in: Hallandale Beach, Hollywood and Sunny Isles Beach. Families with children will also appreciate the several parks found near Mystic Pointe 200.